The Football Foodie World Cup Quarter Finals — aka Battle Cheese — saw the quick dispatch of the snack powerhouses Germany, Switzerland, Brazil and Greece. And while there is no doubt that the four remaining competitors deserve to make the semi-finals, who would have guessed both Uruguay and the Netherlands would meet both in the kitchen and on the pitch today. We’ve spent more than enough time discussing all of these foods over the past month. You know what you’re voting for. 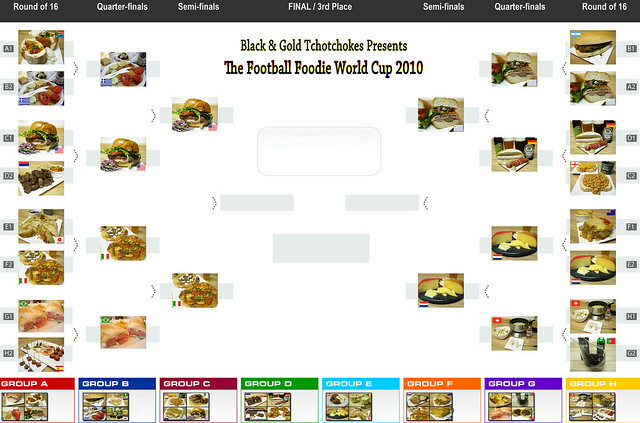 Let’s get moving on The Football Foodie World Semi-Finals. As always, stuffing the ballot box (well, every six hours when the cookies reset) is encouraged, as well as sharing with your friends, family and foes alike to make sure your favorite cuisine wins. Voting ends at midnight, July 7! I am sure there will be a certain contingent who believes that no matter who moves on to the Football Foodie World Cup Finals from this match up, America wins. I disagree. American pizza, even when made by the strictest standards with imported flour, cheese and meats in wood burning stoves by artisan pie makers, still is not Italian pizza. The hamburger represents the best part of being an American, every burger is unique to each person’s taste. It fits every diet and lifestyle; fast food, slow grilled, meat, veggie or vegan. It can cost $1 or $50 and still be a hamburger. It is taking something humble and making it great. Pizza on the other hand (or “in the other hand” in this case), is like the Italian football team; at its best when it’s the most floppy.